Summer is gradually passing into Autumn. On clear mornings the intense golden light meets our eyes as we face east and the breezes begin to rustle the drying deciduous leaves. The plants no longer have a strong sprouting growth; they begin to wither and draw closer to the earth. In the spring and summer, the soul of the earth breathes far out in the cosmos and all the plants are drawn to the sun. Now in Autumn as the earth’s soul breathes back into its physical home, the mantle of Mother Earth, the plants also begin to live more in the roots. It is as if Mother Earth awakens from her summer sleep. The human being has a relationship with this great cosmic-earthly picture. The inner life of the human soul is awakening. Thinking becomes easier – school starts! The festival of Michaelmas comes on September 29, just after the Autumnal Equinox, and is named for the Archangel Michael. In the Old Testament, Daniel names Michael as leader and guide of the Israelites. In the Book of Revelations, Michael battles the dragon. This archetype has appeared in the mythology of many cultures for many centuries. Ancient Asian writings describe Indra. The Bhagavad-Gita speaks of Mirtha. The ancient Babylonians tell of Marduk who slew Tiamat the dragon and created heaven and earth from his body. There are many examples, too, of human beings acting out of a Michaelic impulse; the Greek myth of Perseus, the English St. George and the American legend of John Henry. The Michaelic archetype is of overcoming or transforming evil that is faced through heart-intelligence, courage and strength. Michael shows us the activity that is the essence of the human being – self-development. We all have the possibility of personal transformation. We all have our own dragons, our own lower and less noble aspects. Our selfishness, greed, fear, hate and anxiety can be overcome as we evolve. Michaelmas is a reminder of the process of the becoming human being as we strive toward our full human potential. Michael is an Archangel who represents heart-intelligence, courage and the activity of the will. He awaits our call of help before entering into our affairs, just as he waited for St. George to make all his material preparations to conquer the dragon. 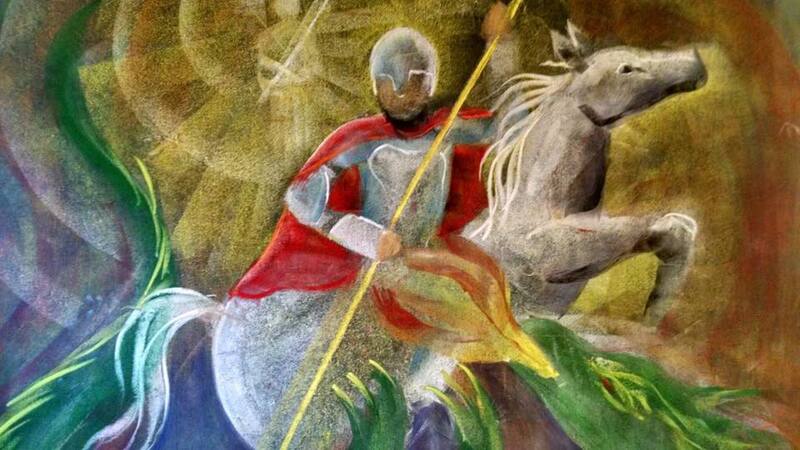 St. George must fashion his sword, dress himself in armor and walk into the dragon’s lair before Michael’s activity can come to uplift him and help him to tame or slay the dragon. It is the same with us. We must recognize the aspect of our selfishness, greed, fear, hate and anxiety and really attempt to turn for the better before Archangel Michael can come to our aid. We must engage our will and step into what we know as goodness. Michael does not hold to any bloodlines or nationalism. Instead his task is cosmopolitan; bringing all people of the earth together, to see each other not as Muslim, Buddhist, Christian, Jew, etc. but as human being. This is the Michael Imagination that we work with in the Waldorf Schools. Rudolf Steiner brings a spiritual scientific picture of Michael’s fight with the dragon in his lectures. He says that the dragon forms itself through the sulphurizing that happens on the earth during the summer heat. This sulphurizing makes the haze that settles into the valleys, it is the naturally occurring sulphur that condenses in the atmosphere because of the increased warmth and light. Counteracting the phenomena of sulphur on earth is a cosmic force that is connected with iron. At this time of the year we can experience some of the most magnificent meteor showers. These meteors are mostly made of iron and as they enter the earth’s atmosphere they contribute a finely vaporized iron that breaks up the strong sulphur quality. Michaelmas is midway between the Summer and Winter Solstice during harvest season. The iron-filled fruits of nature are ripe. We come from the fields and gardens with a bounty of food to nourish us through the darkness of winter and we are filled with gratitude to our Mother Earth. It is earthly-produced food and nourishment that allows us to keep our strength and seek our inner life and purpose. As the sunlight decreases let us keep our inner lights alive and harvest the fruits and gifts of our own and each other’s development. May we, through our courage and our work gain the enthusiasm we need to lead our community into beautiful and good deeds. Join us in celebrating Michaelmas at our annual Dragon Festival! Saturday, September 30th, 11am-2pm at Columbia Park. Food, games, crafts and even a dragon! All are welcome!